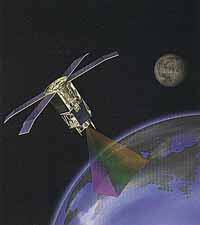 Seastar/SeaWiFS is an Earth observation satellite that has a single instrument: the Sea-viewing Wide Field-of-view Sensor (SeaWiFS), designed to monitor the color of the world's oceans. Various colors indicate the presence of different types and quantities of marine phytoplankton, which play a role in the exchange of critical elements and gases between the atmosphere and oceans. Seastar monitors subtle changes in the ocean's color to assess changes in marine phytoplankton levels, and provides data to better understand how these changes affect the global environmental and the oceans' role in the carbon cycle and other biogeochemical cycles. The satellite was built and launched and is operated by Orbital Sciences Corporation (OSC), who sell the data collected to NASA. NASA then retains all rights to the data for research purposes, while OSC retains all rights for commercial and operational purposes. The mission, now renamed OrbView-2, is a follow-on to the Coastal Zone Color Scanner (CZCS) and the first spacecraft in NASA's EOS (Earth Observing System).